A beautiful reminder of your all-important faith prominently near your heart. 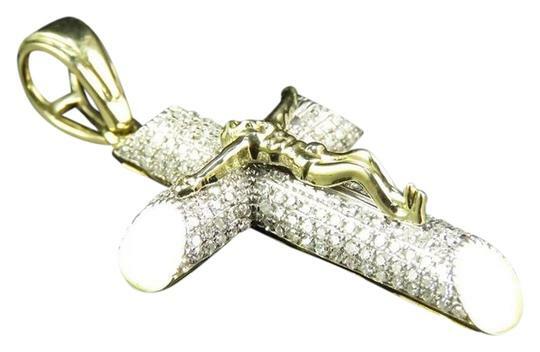 Casted in 10K Yellow Gold, this 3D majestic style features a lustrous polished icon of the crucified Christ on the cross. Shimmering 0.50 ct of genuine diamonds glisten on the cross boasting I1-I2 clarity with H-I color. Its design features a caged back for extra support to withstand everyday wear and tear. 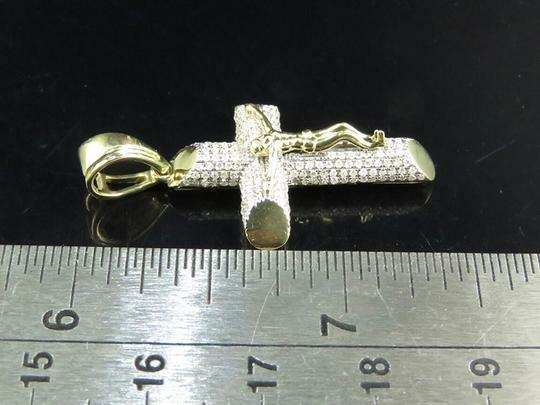 This exsiquite cross measures 1.5" including the bail and weighs approx 3.99 grams. Express your beliefs with this everlasting style cross pendant. Other DetailsPendant comes in a beautiful presentation box. 10K Yellow Gold Diamond 3D Crucifix Cross Pendant 0.50 CT 1.5"